Collaborating with public housing associations, Aarhus increases access to electric cars and creates a new transport service for citizens. By 2030, the transport sector will be the largest source of CO2 emissions in Aarhus. And with projections indicating that the demand for transportation is going to increase further, the municipality is putting new measures in place. In partnership with car service TADAA!, Aarhus Municipality has come up with a plan for reducing the number of petrol cars on its streets by 1,000. The goal is to be achieved by cooperating with public housing associations and private housing communities. These entities commit to making shareable electric vehicles with fixed parking spaces available to residents, making green transportation easy and accessible. Citizen engagement has been essential to the project, which has given citizens better mobility in daily life and high user satisfaction. 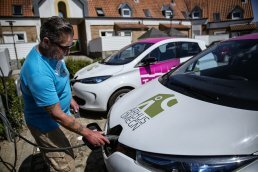 By raising awareness of both the benefits of electric cars and shared car ownership over private ownership, Aarhus Municipality will reduce total energy consumption from transport. In addition to ensuring that parking spaces are close to the homes, the municipality has removed parking fees for TADAA! members in the eastern part of Aarhus. Over the course of the project, 24 shared electric vehicles were on the roads, estimated to replace between 96 and 240 privately owned cars. Road transport is the second largest polluter in Aarhus. Across Denmark, air pollution is estimated to cause about 3,750 premature deaths a year. Electric cars significantly reduce pollution. Accessible, sustainable transport is essential to well-functioning cities. Here, emphasis is placed on increased mobility and accessibility, ensured through effective transport services. Car sharing is estimated to replace between 4 and 10 privately owned cars. Mobility services make it easier not to own a car, reducing environmental impact.